Everyone knows the Tour de France, one of the world’s biggest annual sporting event with nearly 200 cyclists racing against each other, covering 3500 km (2200 miles) of roads in 23 days. Exciting event! However, did you know this 2018 edition was the first official launch of the new Stage Racer 2 in the competition? France Télévisions Sport was responsible for the international signal production of the Tour de France, as well as producing the local French version with three OB-trucks. Synoptic-Broadcast provide since 10 years the technical assistance for the entire broadcast optical fiber facility of France Télévisions. 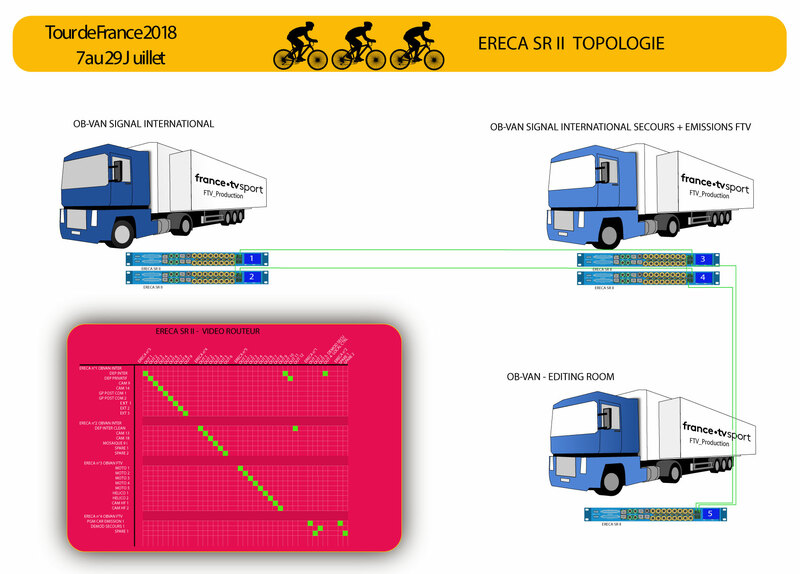 Ereca products are regulars of the Tour de France with the signals transmission of the 2017 and 2016 editions being managed by our Stage Racer units. This year’s event was particular because France Télévisions chose to trust the recently launched Stage Racer 2 and equipped their trucks with five Stage Racer 2, 24 SDI channels version. – Decrease in the number of fibers between each location; The Stage Racer 2 allows for more transported signals per optical fibers between systems compared to the equipment available on the market. – Decentralised management of the entire fiber networked transport system via the built-in web interface. – Stage Racer 2 also offers Analog Audio, AES3, MADI, Dante/AES67 and does not forget the legacy signals like composite video and serial data. The schematic below provides an overview of the entire setup. Thanks to its unique feature of configuration of the SDI port direction, each Stage Racer 2 SDI port could be instantly configured as an input or an output. 50 HD-SDI signals were transiting between each machine only with one duplex fiber. Indeed, the transport technology of the Stage Racer 2 allows for 40 GB/s I/O per fibre trunk between machines, thus allowing 25 HD inputs and 25 HD outputs + Audio, Ethernet, GPIO, serial data per trunk. note: It is possible to go up to 160GB/s I/O using all 4 trunks of the Stage Racer 2. To ensure a secure transmission of all signals in this setup, a ring network was formed between all 5 Stage Racer 2 for redundancy (any topology is possible). For any technical questions, our French distributor Synoptic-Broadcast would be happy to give you more details on the installation.